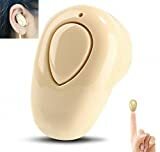 MINI INVISIBLE – Wireless Invisible Bluetooth Headphones,suitable for a variety of scenes. CONSISTENT with HUMAN ESR DESIGH – Independent processor operation,left and right ear painless wear. 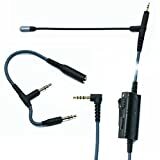 MULTIPOINT CONNECTION – Built-in high and low diaphragm,at the same time connect 2 mobile phone. HD SOUND QUALITY – Listening to music / talk,sound track comfortable call clear. Compact, Ultra mini design, light weigth, popular and easy to carry. Rechargeable, long battery life, fast charging. High-fidelity sound quality, enjoy high quality songs. Voice broadcast when you receive a call. One button to answer call, built-in microphone. Supports two bluetooth devices simultaneously connected. Can be compatible with various bluetooth enabled devices such as Mobile Phones, Tablets, PC and so on. First press once, until you hear “Power On”, and then said “Into the Pairing”, then let go; next continue to the continuous to press twice is the Voice Switching – can hear “English” or “Chinese”; the last click once until hear “Power Off”. WIRELESS STEREO PAIRING VIA BLUETOOTH® 4.1: The Rowkin Bit Charge Single is the smallest cordless stereo Bluetooth headset on the market. Similar to Apple AirPods, Bluetooth 4.1 with advanced audio decode technology enables wireless connections to your smartphones and other Bluetooth devices and gives this ultra-small wireless earbud unparalleled sound quality. P.S. This package includes ONE earbud. 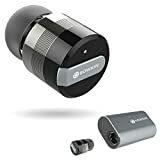 Buy TWO (2) Rowkin Bit wireless earbuds to operate in the stereo Bluetooth headphones mode. LONG BATTERY LIFE WITH DUAL-FUNCTION PORTABLE CHARGER: With the compact conductive portable charging system, your Rowkin Bluetooth earbud will never run out of battery. The dual-function portable charger allows you to charge your wireless earbud up to 30 times and serves as a power bank for your other mobile devices. Simply connect a charging cable to the USB port and charge any device. The enhanced battery in the wireless headphone allows up to 3 hours for music and calls on a single charge. ACTIVATE SIRI, VOICE COMMANDS, AND UNPARALLELED SOUND QUALITY: Siri is just a touch away via the main button on either of the cordless earbud. You never have to take your smartphone out of your pocket, giving you a genuine hands-free, wireless stereo experience. Voice prompts for calls, pairing and caller ID are transmitted directly to the wireless headset. Noise reduction and echo cancellation technology filters ambient noise and enables clearer sound during calls and when listening to music. SMART MULTIPOINT CONNECTIVITY: Pair the Rowkin Bit Charge Single Bluetooth earbud with two Bluetooth source devices simultaneously. For example, connect the headphone to your iPhone or Android phone, and to your iPad, tablet or laptop at the same time. If you are streaming music from the iPad/tablet/laptop, and has an incoming call on the phone, the wireless earphone will intelligently switch to your phone seamlessly and it allows you to answer the call easily without the hassle of repairing. DESIGNED FOR SPORT: The WaterSafe nano coating technology ensures that it’s sweatproof, water resistant, and IPX5 waterproof. Making this true wireless Bluetooth headphone perfect for the gym, running, biking, hiking, exercising, and any other activity. Compatible with iPhone 7/7 Plus/6s/6s Plus/6/6 Plus/SE/5s/5/4s/iPod/iPad/iPad Mini/iPad Pro/Macbook/Macbook Air/Macbook Pro/iMac/Mac Pro/Mac Mini/Samsung Galaxy S6/S5/S4/S6 Edge/Edge+/7/6/5/4/3/Edge/Android/Windows/tablets/laptops/computers.